The cajun roasted chicken is becoming my favorite dish for when I have guests coming over. One reason is that it's great looking - a big colorful piece of tender meat. It additionally allows for a smooth introduction to an exotic cuisine: I always serve this alongside an authentic Romanian garlic sauce. It also offers a lot of variety: some people like dark meat, some like white meat, there are vegetables, an adjustable degree of spiciness via the garlic sauce, and I usually add a few mushrooms next to the chick for vegetarians. Finally, it's very simple to prepare and does not require much attention: you basically spend 30 minutes to put together la pièce de résistance for the whole dinner (the rest of the preparation time is hands free while the bird is roasting in the over). One more note on this recipe. 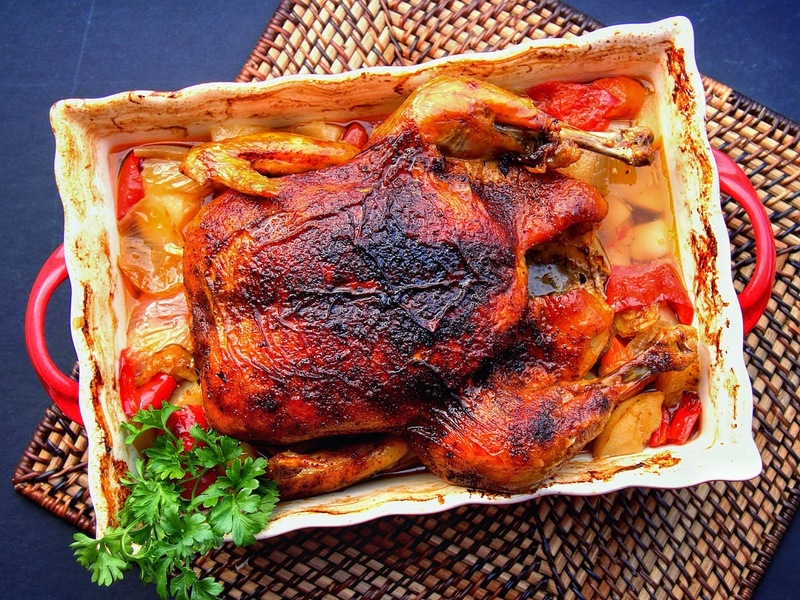 The chicken as a whole is a big piece of meat, and many people find it challenging to choose the appropriate time and temperature such that the chicken is juicy yet properly cooked. This recipe presents a simple solution to the conundrum: cook the chicken covered to keep it moist while killing bacteria, then remove the cover to finish the preparation and to give the dish a nice color. This is the kind of easy trick that can help anyone prepare impressive meals. - Preheat the oven to 450F. - Meanwhile, peel and dice the potatoes and carrots. Boil them for about 10-15 minutes. - Coat a 2 inches deep baking tray with a bit of cooking oil. Add the boiled potatoes and the carrots. Peel and dice an onion, and add it in (I've been told more than once that the onion in this recipe was the best tasting onion the guests have ever tasted). Optionally, dice a squash and a red bell pepper, and add them as well. Gently mix the vegetables until they're equally distributed: you don't want a corner with bell peppers and another one with the carrots - it just does not look as good in the presentation. Add salt and pepper over the vegetables. - Generously coat the chicken with cajun spices (both inside and outside). Place in the baking tray, over the vegetables. - Carefully seal with aluminum foil (helps keep the chicken moist), and cook for two hours in the oven at 450F. Drop the temperature to 400F, remove the aluminum foil, and cook for another hour and a half on the lowest rack. Check periodically - if the chicken skin starts turning too dark, brush it with the juices covering the vegetables, and place a sheet of aluminum foil over the chicken to preserve its color. - Remove from the oven. Serve hot or warm. - The chicken on the cooking tray looks impressive in and of itself. I'd just place it in the middle of the table, on a heat-resistant serving mat. - Use the bunch of parsley for both color and freshness. Either place it on the side, as in the photo above, or alternatively, chop it finely and sprinkle it all over. - With your permission, I suggest you serve this recipe accompanied by some authentic Romanian garlic sauce. It is a killer combination that always makes an impression.